Courting Justice helps us understand the huge challenge South Africa's judges faced after the collapse of the apartheid regime. It is evident that they were aware of the enormous responsibility they had to advance the belief that the new constitution was not only ink on paper, but a reality that could improve their lives. The opening scene of Courting Justice features the Constitutional Court building, the very architecture of which conveys the court's:transparency and accessibility. It is open to all including the school children we see, who are curious about the work done there. One among the many challenges for this Court was and continues to be establishing and maintaining its own legitimacy. Courts, as Alexander Bickel said, are the least dangerous branch of government. They lack the power of the purse and the sword. Their legitimacy is constructed through each of their decisions , the arguments they offer to justify them and the connections these decisions have with improving the lives of the country's citizens . Its legitimacy is also rooted in the diversity and the reputation of its members, as well as in their life experiences and commitments to justice and democracy. With each decision , the future of the new democratic regime, the credibility of the constitution itself and the hope of people in a better future are at stake. Courting Justice was shown in Buenos Aires at the South Africa-Argentina Binational Commission Seminar and at the University of Palermo Law Faculty early in November. The audiences responded with the same heightened enthusiasm that audiences express wherever Courting Justice is shown. Many who saw the film stated their determination to show Courting Justice to friends and constituents back home. I was drawn to Buenos Aires less for the Courting Justice screening than to attend the Binational Commission Seminar. The Seminar , an outcome of the South Africa-Argentina 2005 bilateral agreement, represented another effort toward cooperation between the two countries in the development of many sectors. It was to learn about the bilateral agreement and to learn from the Seminar. That they both appealed to my interests as a political scientist motivated my travelling to Argentina. At the Seminar, hosted by South Africa's Ambassador to Argentina, Tony Leon, and Argentina's Ambassador to South Africa, Carlos Sersale, 150 distinguished participants met for two days in the Palacio San Martin. The theme was "South Africa and Argentina: Gateway Countries to Continental Opportunities." Underlying the cooperative agreement and a thread reappearing throughout the Seminar, is a recognition of the countries' commonalities in their human rights history and in their profiles as developing countries. Not included among these commonalities, though so prominently visible in Buenos Aires during my days there, is the jacaranda. The jacaranda trees were in full bloom despite their unusual timing for Buenos Aires. The profusion of blue, if not an omen, was certainly one of nature's gifts. The Seminar's first day was devoted to the economic sector. The second day was devoted to topics of culture, education, politics and human rights. The connections between the first and second day discussions were often referenced. Ambassador Tony Leon, for example, pointed to the close relationship between constitutionalism and economic growth and noted the embrace by both countries of human rights as the foundation for economic growth. Among the many other themes of interest that were developed, just three are noted here: The first, expressed by Ambassador John Davis ,currently the director of a division in South Africa's Department of International Relations and Cooperation, put South Africa's priority on South America in the context of South Africa's drive to diversify its international relationships, reducing in this way its historical reliance on Europe as its major trading partner. The second theme—related to the first-- was expressed by Minister Ariel Fernandez , Director of Argentina's Sub-Sahara Ministry of Foreign Affairs, International Trade and Worship. He emphasized that the future lies not with the past North-South relationships but with South-South ties. The third, expressed by Professor Shadrack Gutto , Director of the Centre for African Reaniassance Studies at the University of South Africa, was that the future relationships must not repeat the past's scavenging of Africa's wealth. Appropriately, Courting Justice was placed in the Seminar's human rights section.. Preceding its screening was an outstanding panel, the members of which included. Ambassador Sesale; Minister Eduardo Acevedo Diaz, Director-General for Human Rights in the Argentine Ministry of Foreign Affairs, International Trade and Worship; Patricia Valdez, Director for the Memoria Abierta; and Madeleine Fullard, Head of the Missing Persons Task Force in South Africa's National Prosecuting Authority. They addressed different aspects of "How South Africa and Argentina champion human rights and the preservation of memory." South Africa's Embassy in Buenos Aires, in hosting the two day Seminar, undertook an enormously complex and demanding task—the result of which was a highly successful event. It now intends to compile the Seminar's presentations. I will post a notice when that compilation is available. The evening following the Seminar, Courting Justice was shown at the University of Palermo's Faculty of Law. Beatriz Kohen , who shares my interest in judicial gender diversity and who, among her many extraordinary accomplishments which include pioneering the subject of judicial gender diversity in Argentina, teaches at the Faculty of Law, arranged for the screening. Dean Roberto P. Saba enlarged the discussion significantly by commenting on the ever- present awareness by South Africa's Constitutional Court Justices of their responsibility for creating a sound jurisprudential foundation ; on their passionate commitment to the vision of a human rights based constitutional democracy; and on the symbolic significance of the Constitutional Court's architecture in conveying inclusiveness and transparency. I intend to prevail on Dean Saba to provide a paragraph better expressing his views than I have done. If I succeed, I shall post his comments. Audiences throughout South Africa’s Western Cape province -- audiences diverse in age, race, gender and economic circumstances -- have embraced Courting Justice. Every screening has been followed by a discussion, during which the predominant expression has consistently been that Courting Justice is inspiring.. Among the many who have assembled to watch the documentary have been community leaders who have then taken a Courting Justice dvd back into their townships to be seen and discussed by residents there. Annette Fatti, who is championing Courting Justice in South Africa, is a former teacher who has contributed her extraordinary intelligence, creativity, energy and commitment to providing the Courting Justice “experience” to so many in the Western Cape. As noted in a previous Posting and in Facebook comments, more than a thousand middle school and high school students have been involved in a pre-screening classroom preparation (which Annette developed) and viewed the film in a movie theater. (Going to a movie theater is, in itself, a major adventure for these students.) As a consequence of their experience with Courting Justice, more than thirty students took themes from the film—such as courage and persistence in overcoming adversity, and with volunteered professional instruction made their own films. These were shown at a major film festival in Cape Town. In addition some of the students have been matched with students at a New York City school in Harlem, where Courting Justice has provided the core of a course. An education officer at Amnesty International in South Africa contacted Annette after hearing her being interviewed on radio and invited her to present her Courting Justice “workshop” to young trained counselors who are embedded in the township communities. “This is an amazing opportunity for Courting Justice,” Annette reports, ” to be implanted in the townships—to have a real and lasting impact!”. 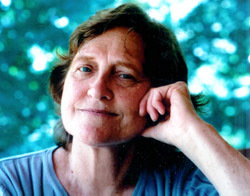 Of special importance among her audiences have been the more than a thousand middle school and high school students in Cape Town who have participated in short Courting Justice "workshops" designed and led by Annette .”I have provided opportunities,” Annette reports, “for students to share concerns … and discuss issues relating to ideas in the documentary. Courting Justice has been the source of great inspiration to many young people from some really ‘troubled’ areas in the city (where there are drug factories and daily shootings by gangs and real hardships).” Some of the themes that have excited the students are about reaching potential, gender stereotyping and abuse, and legal issues which especially touch them. Her response to the students’ enthusiasm about Courting Justice was to teach them to make their own films. 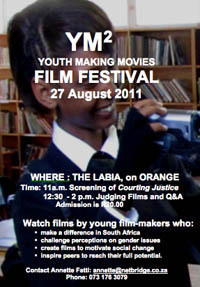 The themes of their films derive from what they were drawn to in Courting Justice and it is on August 27, at Youth Make Movies, that they will show their creations in the Labia Theatre. Each of the top three winning entrants will receive a cash prize. Annette has been featured on radio, talking about the Youth Make Movies. As a result there have been many requests for the film and she has been invited to do a screening and workshop in Pretoria.